At the annual Faculty Day Dinner on February 2nd to celebrate the contributions of members of Fordham’s faculty the History Department’s own Dr. Maryanne Kowaleski was honored with the Award for Excellence in Graduate Teaching and Mentoring. The award was presented by Dr. Eva Badowska, Dean of the Graduate School of Arts and Science, whose citation drew on comments by Dr. Kowaleski’s colleagues and graduate students. Dr. Kowaleski, who earned an M.A and Ph.D. in Medieval Studies at the University of Toronto, has been teaching at Fordham for 36 years, where she has served as not only Chair, Director of Graduate Studies, and Associate Chair for Undergraduates in the History department, but also as Director of the Center for Medieval Studies. 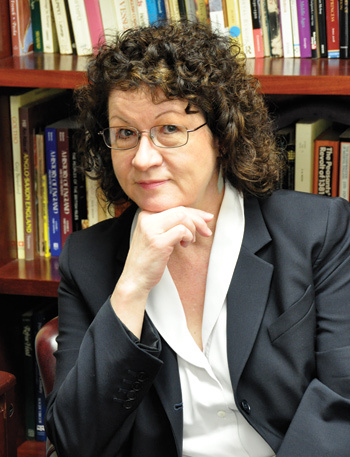 The citation praised Dr Kowaleski’s classroom instruction, noting that she “devises assignments that test and stretch students’ research abilities and has demanding expectations for writing and revision,” including a particularly poignant and punishing research assignment that involved learning the trade of archival research by producing a “county questionnaire.” Her high expectations, however, have always been “wrapped up in a package of support and encouragement.” She arranges to meet students in the UK archives to personally guide them through the British Library and The National Archives in London. “She extends herself personally to students, advising them through difficult times, while still motivating them to stay on course. Her students are well published, frequently cited, and often found in highly regarded positions in academia and beyond.” Although Dr Kowaleski still passes around handwritten index cards with bibliographic citations to her students, she is also “single-handedly responsible for a sizable portion of web traffic to Fordham pages, having developed online resources and databases that the field has learned to rely on” …. That “serve as a training ground in digital humanities for our graduate students.” She is certainly more than worthy of the honor awarded to her this past month.